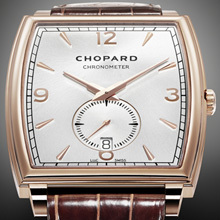 Chopard’s L.U.C collection welcomes a refined model that combines technical qualities and aesthetic virtues. Born at the heart of Watch Valley within Chopard Manufacture in Fleurier, the L.U.C XP Tonneau model, an ultra-thin interpretation of the tonneau or barrel-shaped model, now appears with a particularly distinguished new look. The pared-down dial now features Arabic numerals. The new, slender case gives this watch a modern appearance, while maintaining a touch of tradition that has created the destiny of Haute Horlogerie. The L.U.C XP Tonneau displays the hours, minutes, small seconds, and the date shown through a window at 6 o’clock. All these functions are driven by the ultra-thin, self-winding L.U.C. Calibre 3.97. Entirely designed, developed, fine-tuned and produced in-house, this movement is a mere 3.30 mm thick – a technical detail that incorporates an off-centred micro-rotor and a double barrel (based on patented Chopard Twin® technology) supplying an over 65-hour power reserve. Chronometer-certified by the COSC, a reliable Institute of quality and reliability, the movement follows the contours of the case housing it – a rare distinctive feature matching the demands of Haute Horlogerie. The L.U.C 3.97 proprietary movement can be admired through the sapphire crystal case. The slender, slightly curving case makes a perfect fit on the wrist and is available in 18-carat rose or white gold with satin-brushed and polished finishing. The sunburst silver dial carries the new signature features of models in the L.U.C collection: more elongated Dauphine appliques, Arabic numerals, an extremely fine sunburst satin-brushed finish centred around the word CHOPARD, and a minute track to enhance the high-precision image of these models. The refined face is underscored by the new L.U.C Dauphine hands and framed by a brown or black alligator leather strap complete with a gold pin buckle.